With the release of Infor VISUAL 9, Infor has committed to regular software updates. 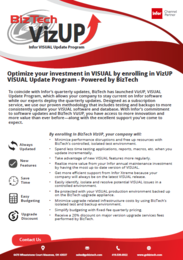 To coincide with these quarterly updates, BizTech has launched VizUP, VISUAL Update Program, which allows your company to stay current on Infor software while our experts deploy the quarterly updates. Designed as a subscription service, we use our proven methodology that includes testing and backups to more consistently update your VISUAL software and database. With Infor’s commitment to software updates and BizTech VizUP, you have access to more innovation and more value than ever before—along with the excellent support you’ve come to expect.